Pixel 2 'walleye' and 'taimen' Specifications and Design leaked! Google's upcoming flagship smartphones, the Pixel and Pixel XL have been leaked online various times. However, all leaks till date suggested the references of the upcoming Pixel Smartphones in AOSP source code. That's going to change from today as a new leak from a XDA is speculating the complete specs of Pixel 2 along with Larger Pixel 2 and their design as well. The larger Pixel device "taimen" will feature a 5.99-inch display (tiny bezels) with a 1440p OLED panel provided by LG, Snapdragon 835 processor coupled with 4GB RAM and 128GB internal storage. Also, the interesting suggestion is that the Larger 2017 Pixel Smartphone will be having similar rear design as the current Pixel phones with a two-tone glass and metal finish, though the glass window is located near the top and no longer encloses the fingerprint scanner. Unlike OnePlus 5, Xiaomi Mi6 or iPhone 7 Plus, the device will feature a single camera with dual LED flash. 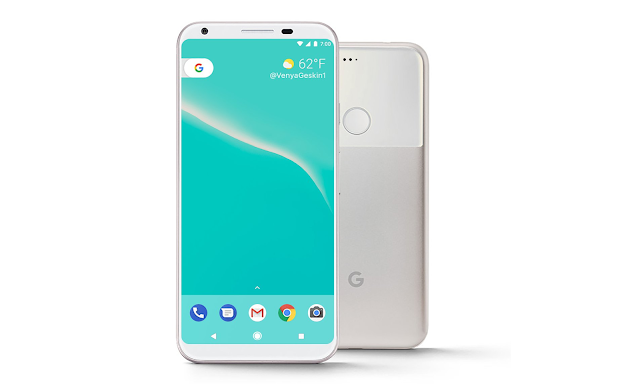 The Walleye (Smaller Pixel), on the other hand will feature a 4.97-inch display with FHD resolution, Snapdragon 835 with 4GB of RAM and 64GB of storage. Google might ditch the 3.5mm headphone jack, stereo speakers to blame. Design wise, the Pixel 2017 (Walleye) will be having familiar large bezels surrounding the display and similar rear design. The report also says that the larger Google device "taimen" could be called "Nexus" as the device uses the name “Nexus Imprint” when referring to the device’s fingerprint scanner. That said, Google might launch these new devices later this year, Will you be buying any of them? Let us know in the below comment section!